If you had to guess the brand of the checked suit pictured below, we doubt that ASOS would be the first name that comes to mind. But lo and behold, the online behemoth has gone and done it again with this stylish and expensive-looking two-piece. Rendered in autumn-ready hues, we fell for the suit the moment we saw it on the ASOS website and it instantly went to the top of our autumn/winter wish list. The piece has appeared on numerous Instagram accounts since its release and, after a little bit of research, we realised that the suit literally looks good on everyone—and that is no mean feat. 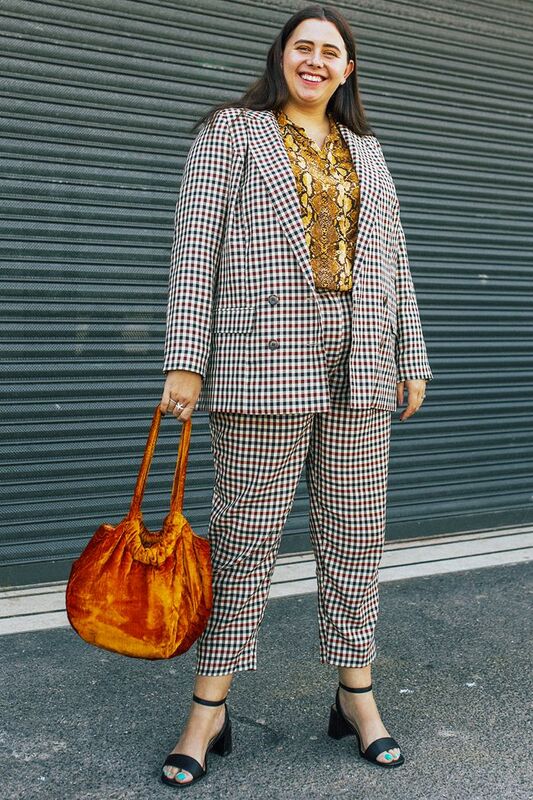 We love how Sara Brown has gone for a print clash by styling her suit with a snakeskin shirt, meanwhile Who What Wear's Emma Spedding has paired hers with ASOS's perfectly pink slingbacks. If you're not a trousers person, then worry not, because ASOS have also created a skirt version (skirt suits are looking so chic right now, FYI) of the checked trousers seen on Hannah Almassi. Whatever way you decide to wear it, one thing's for sure: this is a fail-safe investment for your new season wardrobe. Scroll down to shop the look.